Would you like to gain more leads and customers for your business? I know this is what keep most website owners busy during the day and awake at night. But how can you get more customers through your website? A vital part of your website is your landing page. What do I mean by a landing page? A landing page is a page on your website designed to either capture leads or make sales. This is a page your website visitors “land” usually when they click-through an ad. Having landing pages on your website is important. 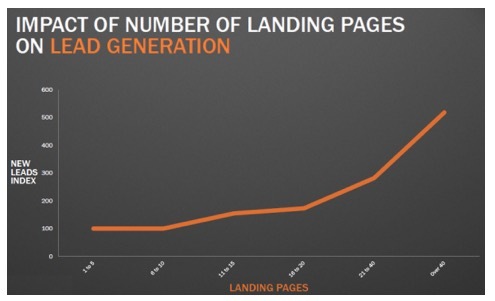 In fact, HubSpot found that companies got a 55% increase in leads acquisition when they increased the number of their landing pages from 10 to 15. However, think about it: does having landing pages automatically bring leads and sales to your website? No way. You have to optimize your landing page to improve its conversions. Wordstream found that the average landing page conversion rate is 2.35%. How can you improve upon that? You’ll learn 7 tips here that will show you how to get the conversion you want from your landing page. The first step to making your landing page effective is to know the people you’re targeting. Who is your ideal customer? Of course, it can be tempting to attract as many people as possible with your landing page. But this will lead to little success. You need to define a buyer persona for the ideal customer you’re targeting with your landing page. A buyer persona is a document that contains the characteristics of your ideal customer. Your buyer persona should be as detailed as possible to give it life and help you to better target this type of person. Creating a detailed buyer persona will ensure that you attract the type of people you want as your customers. As a matter of fact, the only way to convince a visitor to your landing page to take the action you want is through your copy. Words matter and the words you use will determine whether a visitor abandons your page or give you their email address. Your persuasive page copy starts with your headline. With a poor headline, only a few page visitors will proceed to read your landing page copy. According to legendary copywriter, David Ogilvy, on average, only 2 out of 10 people who see your headline will read your copy. With a better headline, you can perform better than the average. Your headline must show benefits to the reader and also provoke their curiosity to get more information about your offer. Having said that, your landing page copy is the next step to convince visitors. What are some components of persuasive copy? It’s clear: you don’t need to leave your readers in doubt with your offer. You should present your offer in simple and clear terms. It shows benefits: people read your landing page copy for the benefits they’ll gain. You must be able to communicate the benefits your readers will gain when they take your offer. When visitors to your landing page click through an ad, it’s because they’re attracted to your offer. Many times, you see landing pages that are different to the connected ads. This causes a message mismatch. Your landing page should be a continuation of your ad. Whether you’re advertising using paid search ads or social media ads, your landing page must be congruent with your ads. When people click through your ad, they want to see a continuation of the offer. Your landing page should provide it. What do you want your landing page visitors to do? When you present your offer to visitors, you should also tell them what to do to claim that offer. Or else, they’ll leave your page without converting. In the past, call to actions like “buy,” “submit,” and others were effective. But you have to be more creative today to gain more conversions. You have to relate your landing page offer to your call to action. For instance, if your landing page offer is to give your reader a discount, your call to action could be “get my discount now.” If you’ve promised to give an ebook, it could be “download my ebook now.” Your call to action should be related to your offer and show urgency. Another tip to keep in mind is to make your call to action button obvious. The color of your call to action button must show a high contrast compared to the color of your page. You want your visitors to be able to see your call to action no matter where they are on your page. When you have people to give their personal details or money to you, then you should have an instant benefit. And this is where a lead magnet comes in. A lead magnet provides an instant benefit to a visitor who submits their personal details. Your lead magnet could be an ebook, a report, discount, toolkit, video, etc. The main aim of your lead magnet is to encourage your landing page visitor to convert. One tip to remember with your lead magnet is that it should be able to solve a problem or provide a kind of benefit for your reader right now. Likewise, when deciding on a lead magnet to use, consider what will likely be attractive to your reader. This is where your buyer persona can help out. When you have a knowledge of the challenges your readers face, then your lead magnet can aim to solve one of them. Your landing page has a single aim: to convert its visitors. Any opportunity you give visitors to leave your page is a distraction that will harm your conversions. But what you’ll find is that most landing pages are choked with many distractions. These could take your visitors away from your landing page rather than convert. Any link on your landing page, except a call to action link, is an opportunity for a visitor to leave your page. When they leave your page, you’ve lost a conversion. The rule of thumb is to have no link on your landing page. Despite this, only 16% of landing pages are without navigation bars. Distractions can only kill your conversions and you should eliminate them. Your landing page should focus solely on conversions. Have you ever seen a perfect landing page? Me neither. No matter your current conversion, you want to improve upon it. There are even more elements of your landing page you can test depending on your discretion. A point you have to keep in mind though is that you should only test a single element of your landing page at a time. When you test many elements at a time, it’s difficult to know the change responsible for your change in conversions. You should also leave your tests to run for a period of time to establish confidence in your results. Landing pages are an important part of your website. But a landing page requires optimization to get the best conversions possible from it. Use the tips from this short guide and you can begin to capture more leads and sales through your landing pages. Guest article written by: Olumide Samuel is a digital marketing writer that produces results-oriented content for small and big businesses. Visit his CopywritersNow blog to see more of his works. Hey Thanks for this. I think you are completely right about moving distractions for the landing page. I think this might be what is hurting my conversions! Best info found on your website about landing pages. Now days Google is more advanced with ranking factor..so from my side this artichoke is best for optimise for your website..all tactics are important . I really enjoyed your post. I have been working in SEM for a couple of digital agencies and had to work on landing pages as well. What I usually suggest to people who own a business is to have as many landing pages as products/services, or at least group of products. I know this represents a huge work, but it is good for two reasons due to the specialization. The first one is customers feel comfortable, they are looking for the product X and this page sells them exclusively the product X. This means 100% match, more trust, you are reliable. Of course you can suggest complementary products/services, such as a phone protection if you sell phones, but not another product. Your brand image and quality would be affected otherwise. The second one is the SEM optimization. You would have content and keywords much more adapted for SEO, while you could do personalized Adwords advertizing, with an adapted meta titla and meta description, what would be much more efficient.